Vertebral column, also known as spinal column, backbone, or spine, is the flexible structure in vertebrates that is formed from cartilaginous or bony structures known as vertebrae and extends from the neck to the tail, protecting the spinal cord, among other functions. The presence of a vertebral column is one of the key defining characteristics of the subphylum Vertebrata (animals with backbones), which includes such well-known groups as jawless fishes, bony fishes, sharks and rays, amphibians, reptiles, birds, and mammals. However, one group that is commonly placed in Vertebrata is the hagfishes, which do not have vertebrae. Hagfish have traditionally been classified in Agnatha (jawless vertebrates) with the lampreys, and could represent a degenerate type of vertebrate; however, some taxonomies list them outside Vertebrata. All vertebrates also have a notochord—an internal, flexible, rod-shaped supporting structure—at some point in their life cycle. In higher vertebrates, such as the classes Chondrichthyes (cartilaginous fish), Mammalia (mammals), and Aves (birds), this notochord is typically present only in the embryonic stages, serving a structural role until the cartilaginous or bony vertebrae form and surround the dorsal nerve cord (although the notochord persists in such primitive fish as sturgeons). However, in lampreys and hagfish, the notochord does persist as the main axial support of the body, and in lampreys it persists despite the development of primitive vertebrae made of cartilage. In addition to protecting the spinal cord, the vertebral column provides structure for the body and a place for muscle attachment, and in humans it helps distribute weight for upright walking. The vertebral column, or spinal column, is a defining structure of animals belonging to the subphylum Vertebrata, along with a central nervous system that is partly located inside this backbone. The bones of this spinal column, known as vertebrae, gives rise to the name of the group. The vertebrates (members of the Subphylum Vertebrata), along with the tunicates (Subphylum Urochordata) and lancelets (Subphylum Cephalochordata), comprise the Phylum Chordata. The notochord is the main defining structure of the chordates, although mainly transiently during the embryonic stages in the higher vertebrates (and likewise lost in adulthood in urochordates). The notochord secretes signalling factors to the surrounding tissues and provides an important role in structure (Stemple 2005). This notochord persists in lower vertebrates (the jawless fish, lampreys and hagfish). However, in higher vertebrates (jawed vertebrates), the notochord mainly serves a role in the embryo, providing the axial skeleton until other parts, such as the vertebrae, form; it is almost invariably replaced by the vertebral column. However, it does persist through the life of such primitive fish as sturgeons (Stemple 2005). Hagfish are a unique situation. Hagfish generally are classified in Superclass Agnatha (jawless fish) in the Subphylum Vertebrata, yet they lack vertebrae. (They are the only extant animals that that have a skull but not a vertebral column.) The issue is whether the hagfish is itself a degenerate type of vertebrate-fish (most closely related to lampreys), or else may represent a stage which precedes the evolution of the vertebral column (as do lancelets). Lampreys also are classified in Agnatha. Like hagfish, lampreys have a notochord that remains throughout life, but they have primitive vertebrae made of cartilage. However, there are different taxonomic schemes for hagfish, including ones in which they are separated from the vertebrates. In all animals, vertebrae are defined by the regions of the vertebral column they occur in. Cervical vertebrae are those in the neck area. The dorsal vertebrae range from the bottom of the neck to the top of the pelvis. Dorsal vertebrae attached to ribs are called thoracic vertebrae, while those without ribs are called lumbar vertebrae. The sacral vertebrae are those in the pelvic region. When multiple sacral vertebrae are fused into a single structure, it is called the sacrum. The synsacrum is a similar fused structure found in birds that is composed of the sacral, lumbar, and some of the thoracic and caudal vertebra, as well as the pelvic girdle. Caudal vertebrae compose the tail, and the final few can be fused into the pygostyle in birds, or into the coccygeal or tail bone in chimpanzees (and humans). In some species the distinctions between these five regions—cervical, thoracic, lumbar, sacral, and caudal—are unambiguous, while in other species it is less obvious (Dierauf 2001). The number of vertebrae in total, and per region, varies with taxonomic group. Snakes have the most total among extant species, with up to 400 total found in some species, and a range of about 100 to 320 in advanced snakes, such as the families Elapidae and Viperidae (Lindell 1994). The number of vertebrae, excluding the caudal vertebrae, is close to 30 in most mammals; the number of caudal vertebrae can differ significantly (Dierauf 2001). Human adults normally have thirty-three vertebrae, with 7 cervical vertebrae, 12 thoracic vertebrae, and 5 lumbar, as well as five that are fused to form the sacrum and the four coccygeal bones that form the tailbone. Human children have more vertebrae than the adults, due to the fusing of some vertebrae in the adult. With exception of two sloth genera (Choleopus and Bradypus) and the manatee (Trichechus), all mammals have seven cervical vertebrae (Galis 1999). In other vertebrates, the number of cervical vertebrae can range from a single vertebra in amphibians, to as many as 25 in swans or 76 in the extinct plesiosaur Elasmosaurus. The sacral vertebrae range from one in amphibians, to two in most birds and modern reptiles, or up to 3 to 5 in mammals. 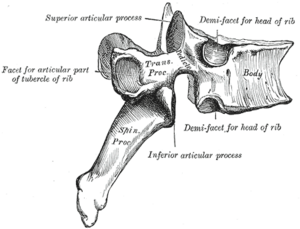 Individual vertebrae are composed of a centrum (body), arches protruding from the top and bottom of the centrum, and various processes projecting from the centrum and/or arches. An arch extending from the top of the centrum is called a neural arch, while the hemal arch or chevron is found underneath the centrum in the caudal (tail) vertebrae of fish, most reptiles, some birds, and some mammals with long tails. The vertebral processes can either give the structure rigidity, help them articulate with ribs, or serve as muscle attachment points. Common types are transverse process, diapophyses, parapophyses, and zygapophyses (both the cranial zygapophyses and the caudal zygapophyses). The centra of the vertebra can be classified based upon the fusion of its elements. In aspidospondyly, bones such as the neural spine, the pleurocentrum, and the intercentrum are separate ossifications. Fused elements, however, classify a vertebra as having holospondyly. 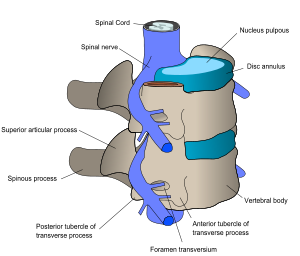 A vertebra can also be described in terms of the shape of the ends of the centra. Centra with flat ends are acoelous, like those in mammals. These flat ends of the centra are especially good at supporting and distributing compressive forces. Amphicoelous vertebra have centra with both ends concave. This shape is common in fish, where most motion is limited. Amphicoelous centra often are integrated with a full notochord. Procoelous vertebrae are anteriorly concave and posteriorly convex. They are found in frogs and modern reptiles. Opisthocoelous vertebrae are the opposite, possessing anterior convexity and posterior concavity. They are found in salamanders. Heterocoelous vertebrae have saddle-shaped articular surfaces. This type of configuration is seen in turtles that retract their necks, and birds, because it permits extensive lateral and vertical flexion motion without stretching the nerve cord too extensively or wringing it about its long axis. Lobe-finned fishes. The vertebrae of lobe-finned fishes consist of three discrete bony elements. The vertebral arch surrounds the spinal cord and is of broadly similar form to that found in most other vertebrates. Just beneath the arch lies a small plate-like pleurocentrum, which protects the upper surface of the notochord, and below that, a larger arch-shaped intercentrum to protect the lower border. Both of these structures are embedded within a single cylindrical mass of cartilage. A similar arrangement was found in the primitive Labyrinthodonts, but in the evolutionary line that led to reptiles (and hence, also to mammals and birds), the intercentrum became partially or wholly replaced by an enlarged pleurocentrum, which in turn became the bony vertebral body (Romer and Parsons 1977). Ray-finned fishes. In most ray-finned fishes, including all teleosts, these two structures are fused with, and embedded within, a solid piece of bone superficially resembling the vertebral body of mammals (Romer and Parsons 1977). Amphibians. In living amphibians, there is simply a cylindrical piece of bone below the vertebral arch, with no trace of the separate elements present in the early tetrapods (Romer and Parsons 1977). Cartilagenous fish. In cartilagenous fish, such as sharks, the vertebrae consist of two cartilagenous tubes. The upper tube is formed from the vertebral arches, but also includes additional cartilagenous structures filling in the gaps between the vertebrae, and so enclosing the spinal cord in an essentially continuous sheath. The lower tube surrounds the notochord, and has a complex structure, often including multiple layers of calcification (Romer and Parsons 1977). Lampreys and hagfish. Lampreys are characterized by a primitive vertebrae made of cartilage. Lampreys have vertebral arches, but nothing resembling the vertebral bodies found in all higher vertebrates. Even the arches are discontinuous, consisting of separate pieces of arch-shaped cartilage around the spinal cord in most parts of the body, changing to long strips of cartilage above and below in the tail region. Hagfishes lack a true vertebral column, and are therefore sometimes not classified as vertebrates, but a few tiny neural arches are present in the tail (Romer and Parsons 1977). Amniotes are a group of tetrapods (four-limbed animals with backbones or spinal columns) that have a terrestrially adapted egg. Amniotes include mammals, reptiles, and birds. The general structure of human vertebrae is fairly typical of that found in mammals, reptiles, and birds. The shape of the vertebral body does, however, vary somewhat between different groups. In mammals, such as humans, it typically has flat upper and lower surfaces, while in reptiles the anterior surface commonly has a concave socket into which the expanded convex face of the next vertebral body fits. Even these patterns are only generaliaations, however, and there may be variation in form of the vertebrae along the length of the spine even within a single species. Some unusual variations include the saddle-shaped sockets between the cervical vertebrae of birds and the presence of a narrow hollow canal running down the center of the vertebral bodies of geckos and tuataras, containing a remnant of the notochord (Romer and Parsons 1977). Reptiles often retain the primitive intercentra, which are present as small crescent-shaped bony elements lying between the bodies of adjacent vertebrae; similar structures are often found in the caudal vertebrae of mammals. In the tail, these are attached to chevron-shaped bones called haemal arches, which attach below the base of the spine, and help to support the musculature. These latter bones are probably homologous with the ventral ribs of fish. The number of vertebrae in the spines of reptiles is highly variable, and may be several hundred in some species of snake (Romer and Parsons 1977). In birds, there is a variable number of cervical vertebrae, which often form the only truly flexible part of the spine. The thoracic vertebrae are partially fused, providing a solid brace for the wings during flight. 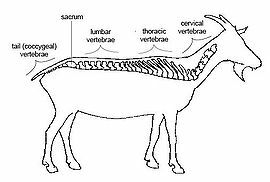 The sacral vertebrae are fused with the lumbar vertebrae, and some thoracic and caudal vertebrae, to form a single structure, the synsacrum, which is thus of greater relative length than the sacrum of mammals. In living birds, the remaining caudal vertebrae are fused into a further bone, the pygostyle, for attachment of the tail feathers (Romer and Parsons 1977). Aside from the tail, the number of vertebrae in mammals is generally fairly constant. There are almost always seven cervical vertebrae (sloths and manatees are among the few exceptions), followed by around twenty or so further vertebrae, divided between the thoracic and lumbar forms, depending on the number of ribs. There are generally three to five vertebrae with the sacrum, and anything up to fifty caudal vertebrae (Romer and Parsons 1977). In human anatomy, the vertebral column, backbone, or spine usually consists of 24 articulating vertebrae and 9 fused vertebrae in the sacrum and the coccyx. Situated in the dorsal aspect of the torso, it houses and protects the spinal cord in its spinal canal and is separated by intervertebral discs. There are normally thirty-three (33) vertebrae in humans, including the five that are fused to form the sacrum (the others are separated by intervertebral discs) and the four coccygeal bones that form the tailbone. The upper three regions comprise the remaining 24, and are grouped under the names cervical (7 vertebrae), thoracic (12 vertebrae), and lumbar (5 vertebrae), according to the regions they occupy. This number is sometimes increased by an additional vertebra in one region, or it may be diminished in one region, the deficiency often being supplied by an additional vertebra in another. Oblique view of cervical vertebrae. A typical vertebra consists of two essential parts: an anterior (front) segment, which is the vertebral body; and a posterior part, the vertebral (neural) arch, which encloses the vertebral foramen. The vertebral arch is formed by a pair of pedicles and a pair of laminae, and supports seven processes, four articular, two transverse, and one spinous, the latter also being known as the neural spine. When the vertebrae are articulated with each other, the bodies form a strong pillar for the support of the head and trunk, and the vertebral foramina constitute a canal for the protection of the medulla spinalis (spinal cord). In between every pair of vertebrae are two apertures, the intervertebral foramina, one on either side, for the transmission of the spinal nerves and vessels. Two transverse processes and one spinous process are posterior to (behind) the vertebral body. The spinous process comes out the back, one transverse process comes out the left, and one on the right. The spinous processes of the cervical and lumbar regions can be felt through the skin. Superior and inferior articular facets on each vertebra act to restrict the range of movement possible. These facets are joined by a thin portion of the neural arch called the pars interarticularis. The thoracic and pelvic curves are termed primary curves, because they alone are present during fetal life. The cervical and lumbar curves are compensatory or secondary, and are developed after birth, the former when the child is able to hold up its head (at three or four months) and to sit upright (at nine months), the latter at twelve or eighteen months, when the child begins to walk. 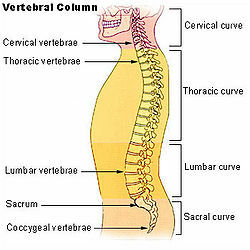 There are a total of 33 vertebrae in the vertebral column, if assuming 4 coccygeal vertebrae. There are seven (7) cervical bones (but 8 cervical spinal nerves) and these bones are, in general, small and delicate. Their spinous processes are short (with the exception of C2 and C7, which have palpable spinous processes). Numbered top-to-bottom from C1-C7, atlas (C1) and axis (C2), are the vertebrae that allow the neck and head so much movement. For the most part, the atlanto-occipital joint allows the skull to move up and down, while the atlanto-axial joint allows the upper neck to twist left and right. The axis also sits upon the first intervertebral disk of the spinal column. All mammals except manatees and sloths have seven cervical vertebrae, whatever the length of the neck (Dierauf 2001). 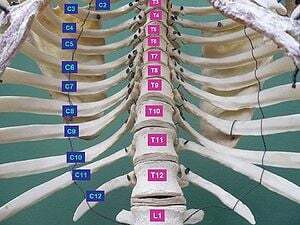 The twelve (12) thoracic bones and their transverse processes have surfaces that articulate with the ribs. Some rotation can occur between the thoracic vertebrae, but their connection with the rib cage prevents much flexion or other excursion. They may also be known as "dorsal vertebrae" in the human context. The term lumbosacral is often used to refer to the lumbar and sacral vertebrae together, and sometimes also their surrounding areas. There are five (5) vertebrae (S1-S5) which are fused in maturity, with no intervertebral discs. The 5 fused bones are collectively known as the sacrum (Drake et al. 2010). There are usually four (4) and rarely 3 or 5 vertebrae (Co1-Co5), with no intervertebral discs. Many animals have a greater number of "tail vertebrae," and, in animals, they are more commonly known as "caudal vertebrae." Pain at the coccyx (tailbone) is known as coccydynia. The striking segmented pattern of the human spine is established during embryogenesis when the precursor of the vertebrae, the somites, are rhythmically added to the forming posterior part of the embryo. In humans, somite formation begins around the third week post-fertilization and continues until a total of around 52 somites are formed. The somites are epithelial spheres that contain the precursors of the vertebrae, the ribs, the skeletal muscles of the body wall and limbs, and the dermis of the back. The periodicity of somite distribution and production is thought to be imposed by a molecular oscillator or clock acting in cells of the presomitic mesoderm (PSM). Somites form soon after the beginning of gastrulation, on both sides of the neural tube from a tissue called the presomitic mesoderm (PSM). The PSM is part of the paraxial mesoderm and is generated caudally by gastrulation when cells ingress through the primitive streak, and later, through the tail bud. Soon after their formation, somites become subdivided into the dermomyotome dorsally, which gives rise to the muscles and dermis, and the sclerotome ventrally, which will form the spine components. Sclerotomes become subdivided into an anterior and a posterior compartment. This subdivision plays a key role in the definitive patterning of vertebrae that form when the posterior part of one somite fuses to the anterior part of the consecutive somite during a process termed resegmentation. Disruption of the somitogenesis process in humans results in diseases such as congenital scoliosis. So far, the human homologues of three genes associated to the mouse segmentation clock (MESP2, DLL3 and LFNG) have been shown to be mutated in human patients with human congenital scoliosis suggesting that the mechanisms involved in vertebral segmentation are conserved across vertebrates. In humans, the first four somites are incorporated in the basi-occipital bone of the skull and the next 33 somites will form the vertebrae. The remaining posterior somites degenerate. During the fourth week of embryonic development, the sclerotomes shift their position to surround the spinal cord and the notochord. The sclerotome is made of mesoderm and originates from the ventromedial part of the somites. This column of tissue has a segmented appearance, with alternating areas of dense and less dense areas. The primary curves (thoracic and sacral curvatures) form during fetal development. The secondary curves develop after birth. 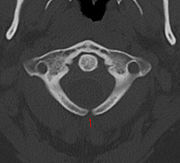 Unfused arch of C1 at CT. The vertebrae may be used as vertical reference points to describe the locations of the organs of the trunk, such as with the transpyloric line (seen at body of L1). If not else specified, it is usually the middle of the vertebral body that is used as reference, although the palpable spinous processes may be located considerably lower. The posterior surface of the vertebral column presents in the median line the spinous processes. In the cervical region (with the exception of the second and seventh vertebrae), these are short and horizontal, with bifid extremities. 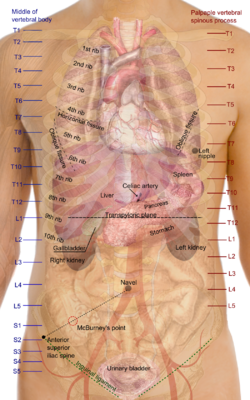 In the upper part of the thoracic region they are directed obliquely downward; in the middle they are almost vertical, and in the lower part they are nearly horizontal. In the lumbar region they are nearly horizontal. The spinous processes are separated by considerable intervals in the lumbar region, by narrower intervals in the neck, and are closely approximated in the middle of the thoracic region. Occasionally one of these processes deviates a little from the median line. 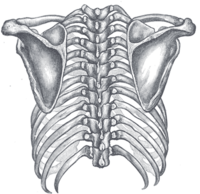 On either side of the spinous processes is the vertebral groove formed by the laminae in the cervical and lumbar regions, where it is shallow, and by the laminae and transverse processes in the thoracic region, where it is deep and broad; these grooves lodge the deep muscles of the back. Lateral to the vertebral grooves are the articular processes, and still more laterally the transverse processes. In the thoracic region, the transverse processes stand backward, on a plane considerably behind that of the same processes in the cervical and lumbar regions. In the cervical region, the transverse processes are placed in front of the articular processes, lateral to the pedicles and between the intervertebral foramina. In the thoracic region they are posterior to the pedicles, intervertebral foramina, and articular processes. In the lumbar region they are in front of the articular processes, but behind the intervertebral foramina. The lateral surfaces are separated from the posterior surface by the articular processes in the cervical and lumbar regions, and by the transverse processes in the thoracic region. They present, in back, the sides of the bodies of the vertebrae, marked in the thoracic region by the facets for articulation with the heads of the ribs. More posteriorly are the intervertebral foramina, formed by the juxtaposition of the vertebral notches, oval in shape, smallest in the cervical and upper part of the thoracic regions, and gradually increasing in size to the last lumbar. They transmit the special spinal nerves and are situated between the transverse processes in the cervical region, and in front of them in the thoracic and lumbar regions. Retrolisthesis is a posterior displacement of one vertebral body with respect to the adjacent vertebral segment to a degree less than a luxation (dislocation). Campbell, N. A., and J. B. Reece. 2005. Biology, 7th ed. San Francisco: Benjamin Cummings. ISBN 0536964173. Dierauf, L. A. 2001. CRC Handbook of Marine Mammal Medicine. CRC Press. Retrieved July 26, 2012. Drake, R. L., W. Vogl, A. W. M. Mitchell, and H.Gray. 2010. Gray's Anatomy for Students, 2nd. ed. Philadelphia, PA: Churchill Livingstone/Elsevier. ISBN 9787811169218. Galis, F. 1999. Why do almost all mammals have seven cervical vertebrae? Developmental constraints, Hox genes and cancer. Journal of Experimental Zoology 285: 19-26. Retrieved July 26, 2012. Integrated Taxonomic Information System (ITIS). 2003. Agnatha. ITIS Taxonomic Serial No. : 159693. Retrieved July 26, 2012. Lindell, L. E. 1994. The evolution of vertebral number and body size in snakes. Functional Ecology 8(6): 708-719. Retrieved July 26, 2012. Romer, A. S., and T. S. Parsons. 1977. The Vertebrate Body. Philadelphia, PA: Holt-Saunders International. ISBN 003910284X. Stemple, D. L. 2005. Structure and function of the notochord: An essential organ for chordate development Development 132: 2503-2512. Retrieved July 26, 2012.